Reminiscent of a city skyline at night, this contemporary pieced table runner has just enough color to make it "pop." 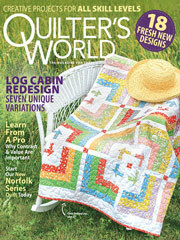 This e-pattern was originally published in the August 2012 issue of Quilter's World magazine. Size: 48" x 12". Block Size: 12" x 12".